The holiday season is right around the corner, providing businesses with an incredible opportunity to generate record sales online. Ecommerce sales have increased year after year, reaching $53.3 billion in 2014, which was a 15 percent increase over 2013. Cyber Monday alone generated $2.038 billion in sales, a 17 percent increase from the previous year. Those numbers are impressive, but even more impressive is the fact that they only account for desktop sales. Consumers are becoming more comfortable conducting ecommerce transactions on their smartphones and tablets, providing business owners a golden opportunity to have a successful holiday season and a strong end to Q4 of 2015. Here are some ways to leverage increased holiday website traffic to generate more revenue. 1. Make sure your holiday offers have clear calls to action. When someone lands on your website you have mere seconds to grab his or her attention. During the holiday season, that window of time is even smaller. Make sure that your holiday offers all feature clear calls to action that instantly command the attention of your visitors. You need to trigger an action as quickly as possible, before your visitors can become frustrated and leave your site to find another option. Make sure to send your traffic to pages on your website that are directly related to the offer that is causing consumers to click through to your site. If you are advertising a particular product, send them to the page on your website where they can quickly purchase the item. Don’t make visitors have to search for what they want — put it directly in front of them. 2. Adjust your sales/lead funnel for quick conversions. A typical sales funnel is designed to nurture leads and gently convert them into sales. Time is limited during the holiday season, but even more important, consumers don’t necessarily need to be nurtured as much. They are planning on buying — whether it’s from you or your competition is left to be decided. Structure your email auto-responder sequences to “touch” your leads more frequently during the holiday season and don’t be afraid to send more direct promotional offers. Typically, you wouldn’t want to be too aggressive and overly promotional with your funnel-marketing communications, but during the peak holiday season, consumers are actively seeking specials and deals. 3. Focus on providing an excellent experience for mobile visitors. Mobile traffic numbers continue to climb — in 2014, 28.9 percent of all traffic came from mobile devices, a 17 percent increase over 2013. As consumers become more comfortable conducting ecommerce transactions on mobile devices, you need to make sure your entire website experience, from browsing to checkout, provides a pleasant user experience. If not, your visitors will leave and find a website that does. First, run your website pages through Google’s mobile-friendly test to make sure the search engine deems your pages mobile friendly. While this gives a good indication, you need to take it a step further. Ask employees, friends and family to run through your website on their mobile devices and provide you with honest feedback. Can they quickly find what you are offering? Can they run through the purchase process smoothly without having to manipulate the screen size? Nothing beats real-life user feedback when it comes to evaluating a mobile user experience. 4. Use exit-intent pop-ups to convert abandoning traffic. When you hear the term “pop-up,” don’t automatically associate it with intruding and invasive. They don’t all have to be that way. While you don’t want a pop-up to fire as soon as a visitor hits your website, using one with exit intent is a great way to convert abandoning traffic. The majority of visitors that leave your website will never return, so why not attempt to convert them one last time? Presenting them with a special coupon code or an exclusive offer, such as free shipping, is often a great way to save some of those exits and turn them into revenue. My company uses Bounce Exchange to manage our exit-intent offer, and it’s by far the most effective source of email subscribers to my newsletter. With the increased holiday-season traffic, even just a small conversion rate on your exit traffic can equal large revenue gains. 5. Enable remarketing across all of your online campaigns. More holiday traffic means more “wallet out” visitors hitting your website that are ready to purchase. Even if they leave your website without making a purchase, you can pull them back in through remarketing. This allows you to follow them as they browse the Internet — displaying highly targeted ads that feature whatever it was that they were just viewing on your site. Even though they didn’t convert into a sale the first time they visited your website, keeping your brand and offer in front of them can help you pull them back in at a later time. This can vary from a few hours to a few weeks. Start to build your remarketing lists now across all of your online advertising campaigns. 6. Use live chat and consider offering 24/7 support during peak holiday shopping days. 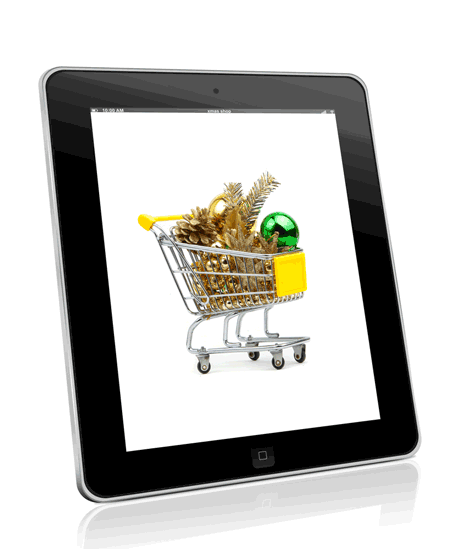 During the holiday season a large percentage of your traffic is visitors with an intent to purchase. To maximize your conversion rates you need to eliminate any possible questions or concerns they might have that stand in the way of them converting. Offering live chat on your website allows your visitors to get answers to their questions immediately. When you eliminate the wait for an answer it increases the chance of visitors purchasing while they are still on your website. You can also set triggers to help save sales. For example, if a visitor leaves your shopping cart without completing the purchase you can automatically initiate an online chat with a simple, “Hi, is there anything I can help you with?” During peak holiday shopping days you might want to offer online chat 24 hours a day. If you are operating on a limited budget you could even consider hiring a virtual assistant to handle live chat during this time period. The most lucrative ecommerce days are right around the corner — use these tips to help increase your revenue and end with a solid final quarter of the year.